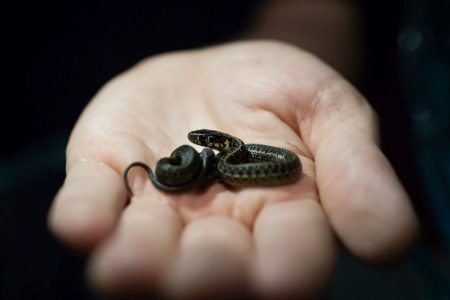 The Deep is proud to be the first zoo or aquarium in the UK to display and successfully breed the rare Lake Zacapu Garter snake. On 27 June The Deep were delighted to welcome the arrival of 7 hatchlings, 3 males and 4 females. The adults (1 male, 2 female) arrived at The Deep in February 2016 and have being living behind the scenes whilst their new home is built. This new exhibit, coming soon to Deep Blue One, highlights fragile river habitats and the species specially adapted to inhabiting them. These snakes are not egg layers, instead the young develop inside the mother within an amniotic sac and are born after a 3-4 month gestation period. After birth the young snakes shed immediately and can grow up to 120cm long. Lake Zacapu Garter snakes (Thamnophis eques insperatus) is one of 7 subspecies of Garter snake classified in 2003 and can only be found in Laguna de Zacapu, Mexico, a small lake only 1km long and 400m wide. With such a small range and the entire population located around a single body of water, this species is highly susceptible to threats in their environment. Garter snakes have been assessed as a whole, rather than by individual sub species. As yet the Lake Zacapu Garter snake is not currently listed on the IUCN (International Union for Conservation of Nature) Red List of threatened species due to there being insufficient data available to assess them. Further evaluation by the IUCN could reveal a higher risk classification, just like there neighbour, the Anderson Salamander, who is classed as critically endangered.